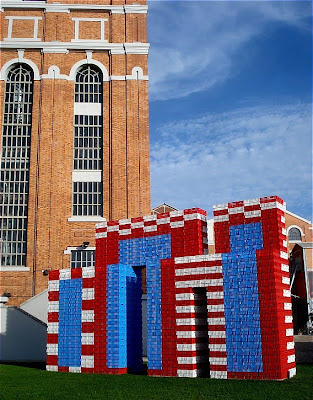 Artwork by Xana made of 2.500 plastic boxes at the Electricity Museum yard. Parece uma casa ou castelo de Lego! Brilhante e linda! Well that just jumped off the portal! What a fun piece! Acordo com Cezar e Léia, parece Lego! It reminds me of Legos! That would have been fun to build, like giant lego blocks. And it makes a pretty picture too. I was going to say, it reminded me of legos..nice work- with the building beside it too. Nice photo, wonderful contrast with the "real" brick building! So I was an artist in my early teens! WOW. This looks like Lego... Very interesting. They must have put a lot of work into this. This made me laugh ... when I saw the title I was expecting an ornate stone arch and found this delightful creation instead. Very colorful. I thought it was made out of those Lego blocks! In Minneapolis, at the Mall of America, they have (or used to have) structures a couple stories tall made from Lego blocks. I was about to shout, "Legos!" Really cool, I like the severe contrast between the two pieces of architecture. Very interesting! It reminds me of an exhibit I saw in London at the Tate Modern. It was series of structures made of white plastic boxes. From a distance they looked like ice blocks. Interesting piece of artwork. You might interested in the sculptures from an outdoor exhibition in Sydney that I've featured in my blog today. Are you sure it's not LEGOS?! It would be fun to help them make that, just a big toy. Thank you to JM for the picture!....and all the people for the commentary !